Assorted Broncos designs on BIC lighters. The only thing I could have asked for is a lower price. 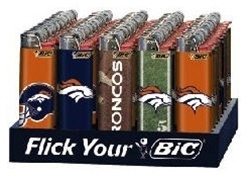 But the item I purchased is not currently in production, so the fact that they are overcharging less than anyone else who still has and is trying to sell a case of Broncos Bic lighters, speaks volumes. I really appreciate that the products I purchased were available at all, not to mention at the best price to be found, and I duly appreciate experiencing zero problems with making the purchase, or receiving my products.